Naples was one of the main musical centres of Italy and even of Europe in the first half of the 18th century. But only a small part of what was written there is known today. Especially the research and recordings of Antonio Florio have brought some interesting compositions to light, in particular from the late 17th and early 18th centuries. From the mid-18th century it is mostly music for the stage and instrumental works which have been performed and recorded. Sacred music has received relatively little attention. This could well be due to the style of many sacred compositions, which show the strong influence of opera. That also comes to the fore in what is the most famous sacred piece from Naples, the Stabat Mater by Giovanni Battista Pergolesi. For that reason it met some stern criticism in its own time, for instance from Giovanni Battista Martini, the composer and theorist from Bologna. He is quoted in the booklet to the present recording thus: "[How] could that music, which is suitable for expressing comical and ridiculous ideas, such as those in La Serva Padrona, ever be adequate to express sacred, devout and penitent sentiments, such as this music of the Jewish people? These sentiments are so much in conflict with each other, that the same music cannot be the expression of both". He may well express the sentiments of many of today's music lovers, too. That said, considering the popularity of Pergolesi's work in our time—judging by the many performances and recordings—there should be a market for recordings of pieces which are comparable in character. 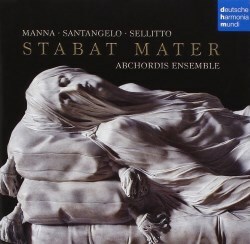 The Stabat Mater by Giacomo Sellitto is an example of a piece which is not only of the same character but in fact shows the strong influence of Pergolesi's setting. Very little is known about the composer. His elder brother Giuseppe is better known; he composed both secular and sacred vocal works. Giacomo wrote 72 fugues for harpsichord, two works for the stage and some sacred works, among them this Stabat Mater. The work is scored for four solo voices, strings and basso continuo. It is divided into 14 movements, the majority of them in the form of an aria for solo voice. Some arias, such as Tui nati for soprano, have a strongly operatic character. The opening, scored for the full ensemble, is quite expressive. The first half is dominated by a descending figure which includes chromaticism. In the closing line the words "dum pendebat" are split into single syllables, sung staccato and separated by short figures in the strings. In the fourth movement the words "moerebat et dolebat" are illustrated by repeated notes in the strings. In the next section the opening word "quis" is repeated a couple of times, each time followed by an eloquent pause. The tenth movement, Virgo virginum praeclara, includes many Seufzer. In the next movement the alto largely imitates the soprano. This could be an illustration of the idea of "following Christ" as is suggested in the text: "Let me carry Christ's death, the destiny of his passion". The following movement refers to the day of judgement—"Fired and excited by you, O Virgin, let me be defended on the day of judgement"—and is, as so often with such texts, scored for bass. The ensuing movement is again an expressive setting of the text, scored for the full ensemble: "When my body dies, let my soul be given the glory of paradise". The work closes with "Amen", again for the full ensemble. The fact that Neapolitan music of the 18th century is still far away from being thoroughly explored also explains that we know so little about composers like Sellitto. That goes even more for Aniello Santangelo about whom nothing is known at all except that he worked in Naples as a master of violin between 1737 and 1771. Only instrumental works from his pen have come down to us: a flute concerto, six sonatas for two cellos, twelve trios for two violins and cello and the Sinfonia in F included here. It has been preserved in a collection of instrumental works compiled by the Stockholm literary and musical society Utile Dulci in the second half of the 18th century, which is now part of the library of the Royal Swedish Academy of Music. Scored for strings—two violins and viola—and basso continuo, it has three movements: Allegro, Andante, Presto. The Andante is a bit too slow in this performance. This sinfonia suggests that the other works by Santangelo deserve to be performed as well. The best-known of the three composers on the programme is Gennaro Manna; he is the only one who has an entry in New Grove. He is mainly known for his operas. Unlike other Neapolitan composers he never composed comedies but rather concentrated on opera seria. Manna's oeuvre also includes a considerable number of sacred works. György Vashegyi recorded the Responsories for Holy Week (Hungaroton, 2010). This disc opens with the Lectio III Defunctorum from the Lessons for the Office of the Dead. Strictly speaking, this is no music for Holy Week: the text is from the book of Job (ch. 19, vs 20-27) but thematically it fits well into the programme. The first verse says: "The flesh being consumed, my bone hath cleaved to my skin, and nothing but lips are left about my teeth". The 25th verse is also included in Handel's Messiah: "For I know that my Redeemer liveth, and in the last day I shall rise out of the earth". This piece is scored for soprano, two violins and basso continuo, and divided into five sections. The first is an aria in binary form. It opens with a descending figure which is repeated several times and contributes to its expressive character. Next comes an accompanied recitative; each of the first two lines is followed by a pause. The three remaining sections are arias. At the close of the first of these, the descending line opening the first section returns. None of the arias in this piece have a da capo, but all include a cadenza. This contributes to their operatic character. The performance of this piece is not entirely satisfying, largely because of Marie Lys's too frequent use of vibrato. That is also the case in the Stabat Mater by Sellitto. She keeps it nicely in check in the duets and the ensembles, so one wonders why she did not do the same in the solo sections. The other soloists, more consistent in this department, deliver fully idiomatic performances. The ensemble considerably contributes to the expression in these pieces. Having said that, this is certainly music one has to get used to. In Sellitto's Stabat Mater some movements include the appropriate expression as I have indicated, but some arias are quite operatic. I feel much sympathy with Martini's comment. The same goes for Manna's Lectio VIII Defunctorum. But if you do not have any problem with Pergolesi's Stabat Mater, you will not have any with these pieces either.